A simple to use mobile and web application that makes laundry easy and convenient. 3 simple steps to use the app. The app picks your present location or you choose another location or city, to view nearby laundries. Pick a laundry based on services, offers, pricing, rating and reviews. Get your clothes washed using any of our 3 services. The laundry will come and pick up and deliver your clothes at your doorstep. Buy a coupon, drop off your clothes at the laundry and get great discounts. Get special discounts on special occasions. Select any of these 3 services and make laundry easy. Wish2Wash was started from a very simple idea, keeping in mind the increasing shortage of time and the want for our daily chores to be done without much trouble. One such tiresome yet important 'job' to be done is the need and want of clean clothes – your Laundry!! But certainly you again do not have the time for this in today's fast paced life. So, we have made that very easy for you, to help you get your laundry done – with just 3 clicks by your finger. Keeping this in mind, Wish2Wash is here to make your life easier and cleaner. 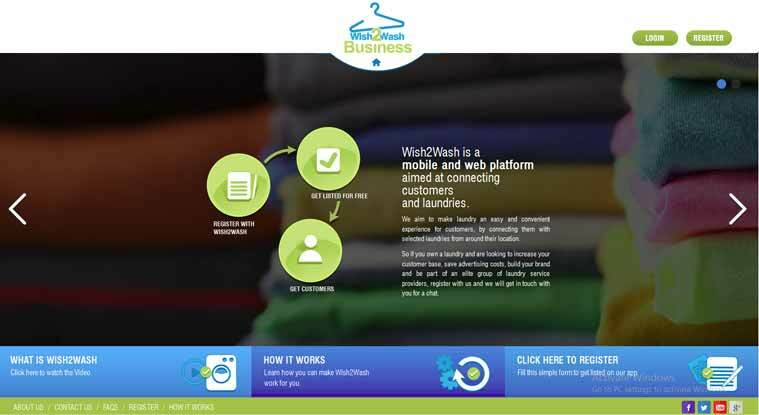 Wish2Wash proposes to offer a very easy and simple Mobile phone application and website based platform to get your laundry and dry cleaning done. We will connect our users and customers to the Laundry of their choice in their locality or anywhere in the world. The customers will have the option to choose the Laundry based on location, pricing and services offered. Wish2Wash is the solution for people who want to get their clothes washed and cleaned with least stress and time involved. Our target customer is YOU – the housewife, the single businessman, the young college student, the world traveller, the backpacker, the senior citizen, the holidaying couple – everyone!! We intend and plan to be present in every part of the world. Our coverage and reach will be an ever growing process day after day. All that you will need apart from a smartphone with our app or our website; will be the NEED or WANT to clean your clothes. And pooff – It will be done with just 3 clicks!! So whether you are at home and need your linen washed or at work and your curtains cleaned or travelling abroad and need your dinner jacket dry cleaned, we will help you get it done. Just one Mobile App & Website for all of your cleaning needs – Anytime Anywhere. Do you own a Laundry? Visit our Business site, Register with us and let customers find you on Wish2Wash.